Remember me? Man, that vacation was fun. 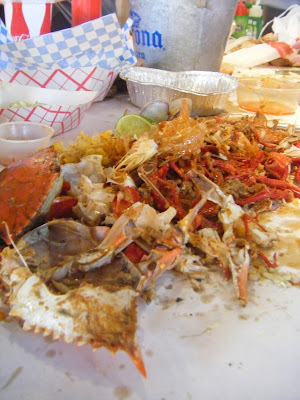 You haven’t been to Crawfish King yet? Didn’t you read Providence Cicero’s review? Heads up! 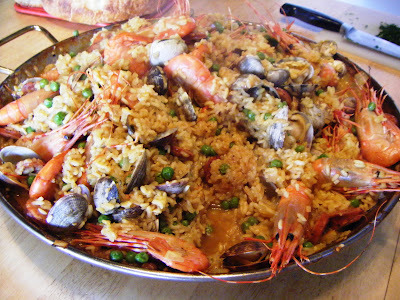 Mac’s making paella again! I always say my buddy David makes the best pizza, but I’ll say it again. “Pizza Night” is part of our Orcas tradition. 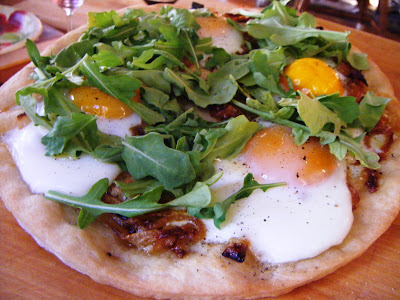 This pie was topped with arugula, caramelized onion and eggs from island chickens. 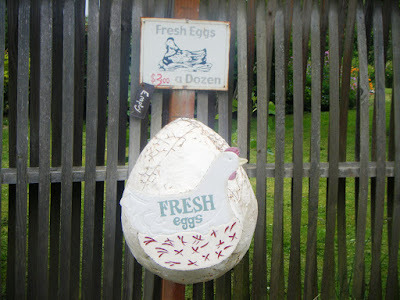 Our favorite egg vendor (photo from last year). This year they’ve raised the price to $4. Worth it! I don’t know how high the cotton was, but the fish were jumping at Moran State Park (and also right outside our cabin at Beach Haven, giving the otters and eagles a thrill). A guy fishing right next to us got his limit of trout (plus his wife’s!) using tiny treble hooks, so we went shopping for some of those. They work! 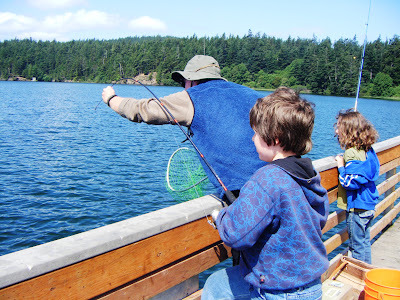 Nate later caught two trout — with help from his “bait boy.” I had no luck whatsoever. Must have been that oversize surf-rod I was using. Bait boy helped the kids unsnare lines. I dressed and fried Nate’s trout. On the only truly rainy day spent on Orcas — one of our last — Mac and I treated ourselves to a long, leisurely hour at Darvill’s Bookstore, where I ran into Seattle chef Becky Selengut and her partner April. 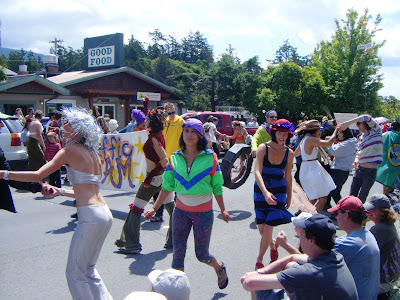 You may know Becky (who teaches classes at PCC). I adore her blog, Chef Reinvented. And though I follow her regularly via Twitter, it was the first time we met in the flesh. Because I spend so much time indoors facing a computer, spending so much time outdoors was a treat. At home I puttered in the garden and last night we headed into the backyard to enjoy some time with our pals Ken and Susan, a couple soon to embark on the ultimate vacation: They’re leaving their jobs and sailing around the world on their floating home — a 42-foot sailboat. 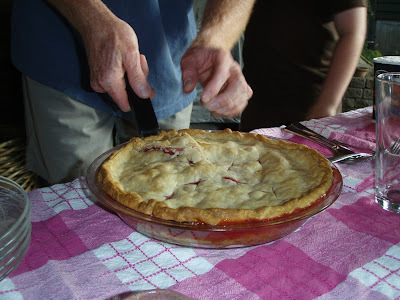 Mac roasted lamb on the Weber and made a cherry pie in their honor, using fruit from our Montmorency trees. Pie cherries from our 12-year-old dwarf trees. Ken and Susan have been living on a sailboat at Shilshole for 10 years, so they’re used to the confined space, but still. I mean, I love Mac and all, but we can hardly inhabit the same kitchen — what with him seasoning his lamb and making a pie and me steaming Persian rice — let alone sail the seas together. 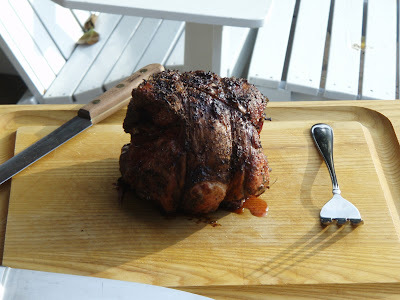 Thrilling to the grill with Mac’s boneless leg ‘o lamb. 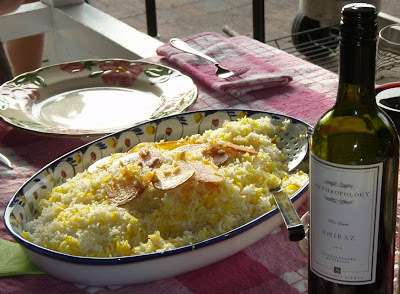 Saffron-scented Persian rice, with potato tahdeg. Don’t be so impressed, the crust is courtesy of the Pillsbury Dough Boy. 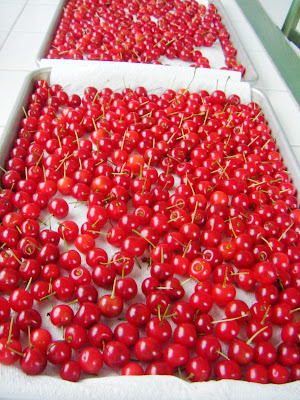 This year’s cherry crop, picked yesterday, should be enough for only two pies thanks, in part, to the robins who have a thing for our cherries. Who can blame them? 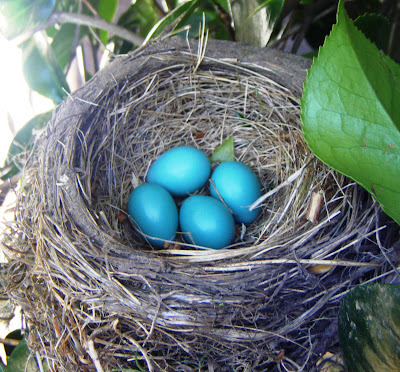 Speaking of robins, look what we found abandoned in our camellia tree. Here’s hoping a crow doesn’t swoop down and use them for pizza. Sure I had fun on vacation, but there was a lot of work to be done during my hiatus from work. Including our long-delayed yard sale — the one in which we off-loaded years worth of “one man’s trash is another’s treasure.” (Anybody need a rocking chair with dog-chewed runners?) I’m still lamenting the loss of six champagne flutes I wish I hadn’t sold for $3, as well as a set of placemats/napkins from India I was loathe to part with — purchased for a buck by a lovely raw foodist from Richmond Beach. Doing my best mental gymnastics, I thought, “OK, who is this gal? Someone from Nate’s school? A neighbor whose face isn’t registering?” And when I asked, she said, “No, you don’t know me. I read your blog!” So, whoever you are, thanks for saying hi and for spending time here. Knowing that folks like you are out there reading certainly lessened the blow of re-entering the deadline-driven work world. 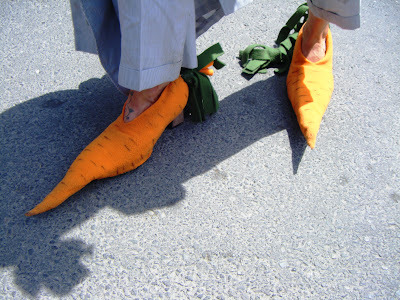 Meanwhile, Eaters, pardon me while I do some administrative work, check my phone messages and delve into my scary email inbox. If you’ve got news I can use — places you’ve been, stories you’ve heard in my absence — feel free to email me or post a comment right here. Later!